David Maus Volkswagen welcomes the 2012 Beetle to its showroom floor, and hands over the keys to one local Oprah Winfrey Show fan on October 13th, who received free 2.5L 2012 Beetles as giveaways on Winfrey’s “Ultimate Favorite Things” episode that aired November 17, 2010. Redesigned for only the second time in history, the sportier 2012 Beetle is a modern interpretation of the iconic Beetle design. It balances classic beauty with modern edge and no-compromise German engineering, offering enhanced performance and fun-to-drive dynamics that define the Volkswagen driving experience. Available 2012 models include the 2.5L Beetle and 2.0L Turbo Beetle. The 2012 Beetle was built to perform—it features a lower, more aggressive stance. The increases in width and length allow for better handling and increased interior space. These modifications complement Beetle’s vintage characteristics, including its unique shape. The second skin program allows customers to design their 2012 Beetles with an array of accessories for interior and exterior personalization. The 2.5L Beetle has a starting MSRP of $18,995 plus destination fees, and comes standard with a split folding rear seat, aux-in for portable audio players, a leather steering wheel, unique and customizable17-inch alloy wheels, and an eight-speaker audio system. Attractive options include a kaeferfach additional glovebox, Bluetooth® technology, iPod® connectivity, heated front seats, three-color interior ambient lighting, a panoramic sunroof, 18-inch alloy wheels, the Fender® Premium Audio System, and leatherette seating surfaces. The 2.0L Turbo Beetle, which has a starting MSRP of $23,395, comes standard with a six-speed manual transmission, with the option of Volkswagen’s DSG© dual-clutch automatic transmission. In addition to the standard equipment found on the Beetle, this model adds Bluetooth® technology, iPod® connectivity, three-color ambient lighting, larger brakes with red calipers, the kaeferfach additional glovebox, sport seating surfaces, 18-inch alloy wheels, a rear spoiler, foglights, three additional gauges n the dashboard, and alloy pedals. The Beetle is covered under the no-charge Carefree Maintenance Program. All scheduled maintenance is covered for the length of the New Vehicle Warranty—three years or 36,000 miles, whichever occurs first. For more information on the 2012 Beetle models, including additional trim options, vehicle specifications and images, visit http://media.vw.com/models/beetle. Volkswagen Auto Group unveiled its redesigned Beetle yesterday, and as expected it looks a bit sportier and more aggressive than the previous model, which has been around since the 1998 model year. The 2012 Beetle come with a 2.5-liter five cylinder gasoline engine, a 2-liter diesel or a 2-liter turbocharged gas engine. Transmission choices include a 5-speed manual, 6-speed automatic or 6-speed dual-clutch version, depending on the model. 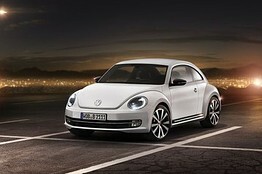 The new redesigned Beetle is scheduled to hit showrooms late summer – early fall. Volkswagen America announced the Final Editions for the 2010 New Beetle and New Beetle Convertible, which will mark the last of Volkswagen’s current generation of the iconic models. Available at either David Maus VW Showroom this spring – the Final Editions will be limited to only 1,500 units each. The Final Editions will receive a host of unique upgrades and touches that will truly set them apart from others cruising across the country. The New Beetle was launched in 1998 with the convertible following a year later and both have become an iconic vehicle of the VW line-up. For the Final Editions VW decked out the exterior in special Aquarius Blue paint with a painted black roof on the coupe and a two-tone Aquarius Blue and Campanella White paint on the convertible. The interior showcases a few new touches such as the steering wheel, special interior paint, and much more. You are currently browsing the archives for the Beetle category.